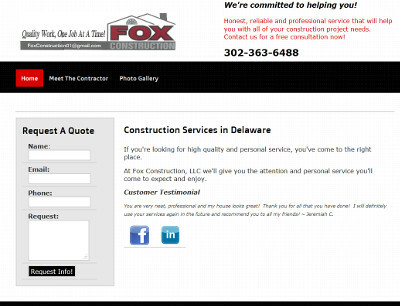 BsnTech Networks just completed a website for Fox Construction, LLC out of Delaware. Fox Construction servces any kind of construction service request and serves the New Castle, Kent, and Sussex counties in Delaware. Tara, a representative of the company, had contacted us a few weeks back asking about some options they would have at re-designing their website and getting found more in the search engines. At this time, they proceeded to have us create a new website for them and take care of a new domain name and website hosting. However, it wasn’t within their budget for the Search Engine Optimization (SEO) at this time. Tara mentions that they most likely will have us do some SEO work on the website in a month or so. Fox Cosntruction, LLC’s website is at foxconstructiondelaware.com. Logo Design For PlumTree Financial, Inc.